One of the great advantages of using an online planbook, such as PlanbookEdu, is the ability to set up your general schedule once and then add details for each week. With PlanbookEdu we make this very easy to do. After creating your planbook, go to the first week of plans. 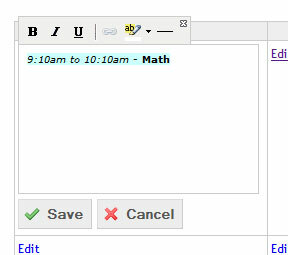 Begin filling in your schedule by clicking "Edit" for each box. You want to enter in the general information for that period, such as the times and subject. We don't have specific fields for these; rather we give you the tools to format the box however you like. You can bold, italicize or underline the text, add strikethrough text, add a bulleted or numbered list, add a background color to differentiate subjects, and highlight text. It's completely up to you. Now that you have the general template for the period, you want to set it to repeat. By default all entries are "one time" entries. Change the entry to appear "Once", "Daily", "Weekly", or based on your schedule rotation. Daily entries also allow you set if the entry should appear just this week or for all weeks. Weekly entries can be set for all week or just going forward. The going forward option is useful if the template needs to change midway through the year. Simply edit the box, adjust the template and set it as "weekly, going forward". This will allow you to have one template for everything before a certain date and a different one for everything after. 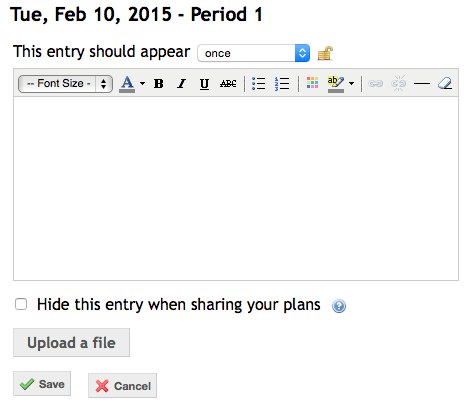 Once you have your template setup you'll want to add your lesson plans for just that block for a single week. There are two ways to do this. The first is to click the "edit" link and change the entry to appear "once". Any changes you make will be applied to just that block and leave your template for all the other weeks. The second option is to use the quick edit. To enter quick edit mode simply double click on any of the boxes. Any changes saved from the quick edit mode will be applied to just the box. It's the same as clicking "edit" and changing the repeat option to "once". For more information, see our video How to Create a Template.